B here. It’s hot today here in the Central Valley of California, and I assisted M while he changed the oil in our truck. After that it was cocktail time. But what to have? I wanted something light but not overly summery. I wanted to go into my air conditioned living room and pretend it was September. I picked up Esquire Drinks and headed to the chapter on Tall Drinks. There I found the Harvard Fizz. David Wondrich of Esquire Drinks describes the Harvard Fizz as “an elegant little brain tonic.” My brain tends to misbehave, so I thought this drink just might be the ticket. M agreed to give it a go. I assisted by washing our Mikasa Windlass highball glasses, which had collected a fair amount of Central Valley dust. Too much time had passed since we last used them. Such a shame. Strain into chilled small Collins glass and fizz to an inch or so from the top. M thought it thin and light, but he would drink it again. For today, for me, it was what I wanted and needed. The flavors of more serious cocktails minus the heft. The seltzer lightened the brandy and vermouth to a drink suitable for a summer afternoon when one wants to dream about autumn: the burnished leaves and crisp breezes, the chill in the air and that Manhattan made with Sazerac Rye that warms the blood. Sounds light and thirst-quenching. Yum. Which soda siphon do you have, and do you recommend it? I’ve just gotten interested in making our own bubbly water. 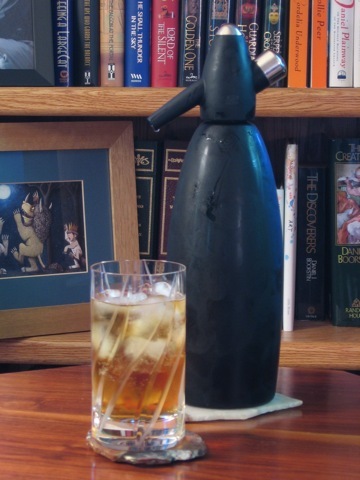 Beautiful soda siphon and great recipe. We tried the “Vespa” recipe from the Casino Royale Bond movie (w/o the quinine…still searching for that source) and it was pretty good. I’ll have to look into the Wayne Curtis book.